From the fabric to the finished garment. Ours is a vertical factory. Raw materials enter and finished garments exit. 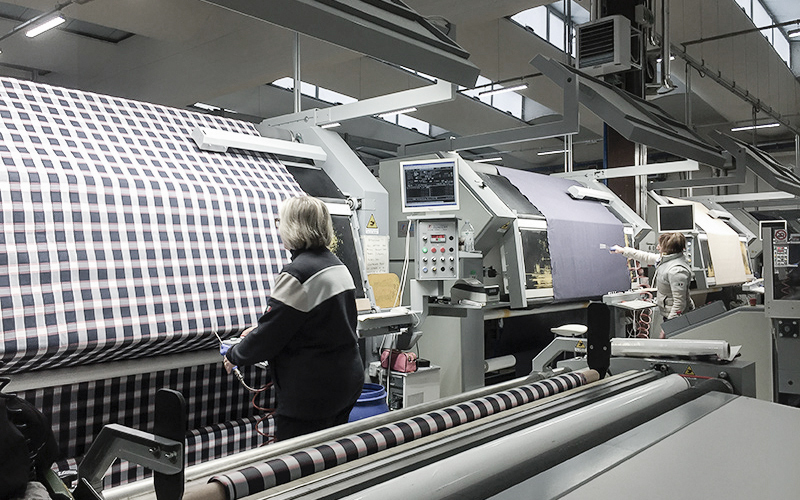 The fabric production process is the one that uses the majority of our most important resources in terms of investment in technology and human resources. 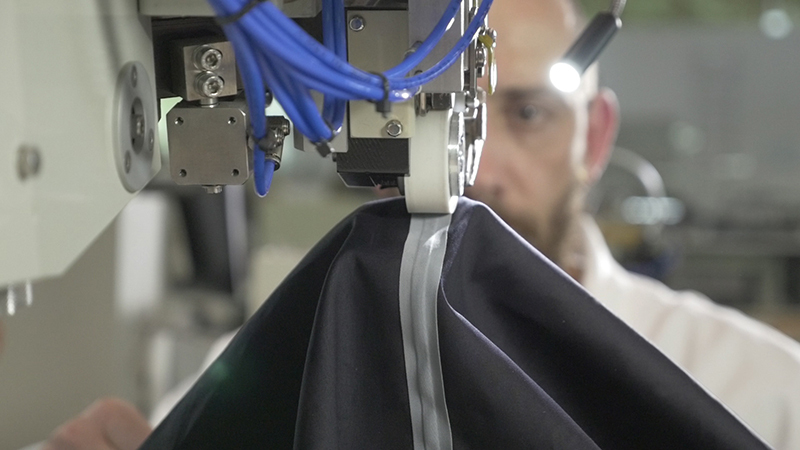 This is why, in this section, we would like to explain the production cycle that each fabric goes through, illustrating the various production processes and the various machines that are used within our factory in Ponte di Colle. The raw fabric is inspected by highly specialized and cataloged first and second choice personnel, the unsuitable fabric is discarded already at this stage. 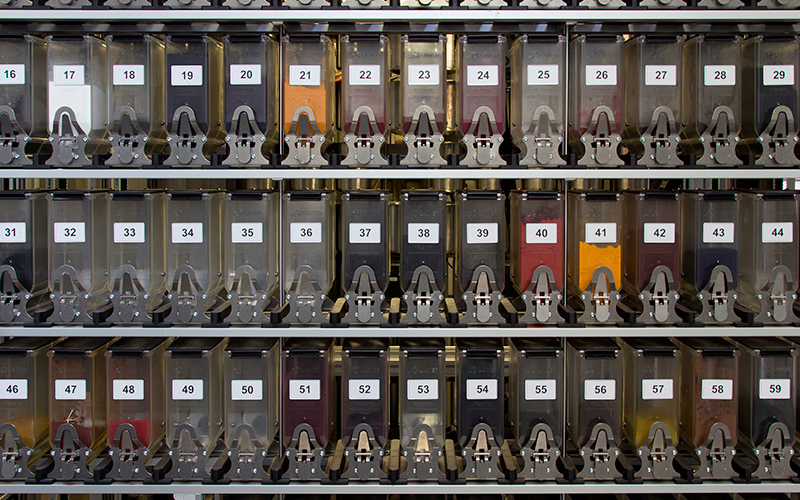 The yarn, greige and dyed, is automatically stored by a robot managed by a computer. 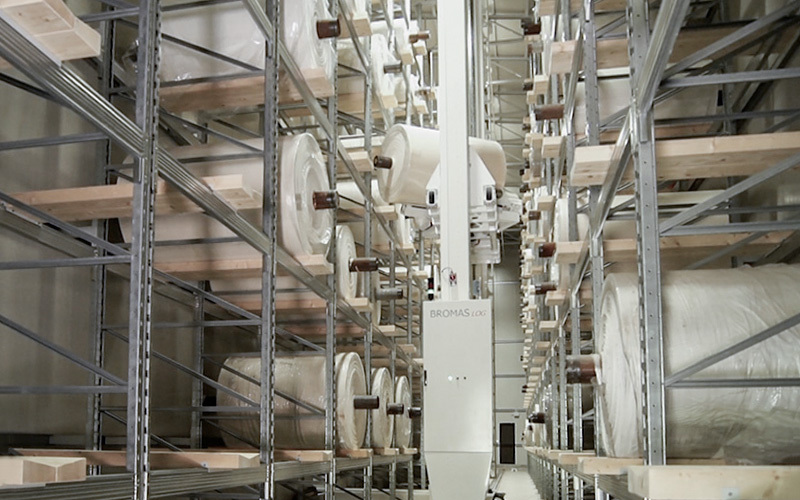 The yarn,wounded in big reels of thousands meters, is put by a computer-instructed robot. 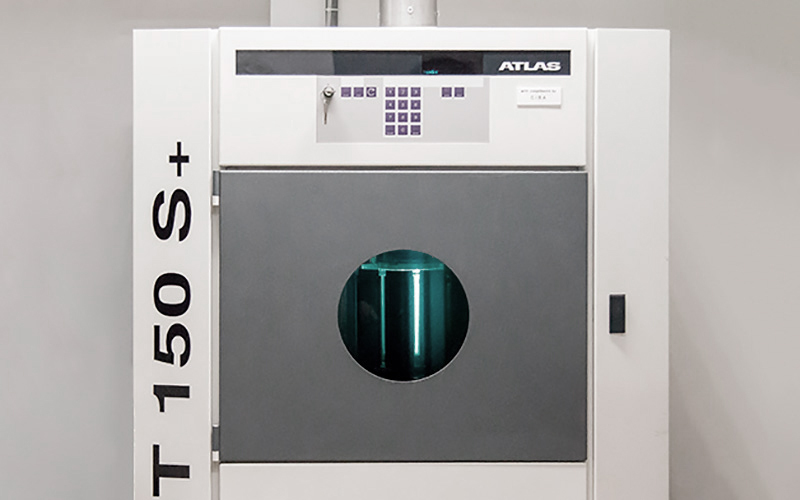 This instrument is capable to measure optical and mechanical alterations of the fabric, through simulations of atmospheric conditions, such as irradiation, heat and humidity. 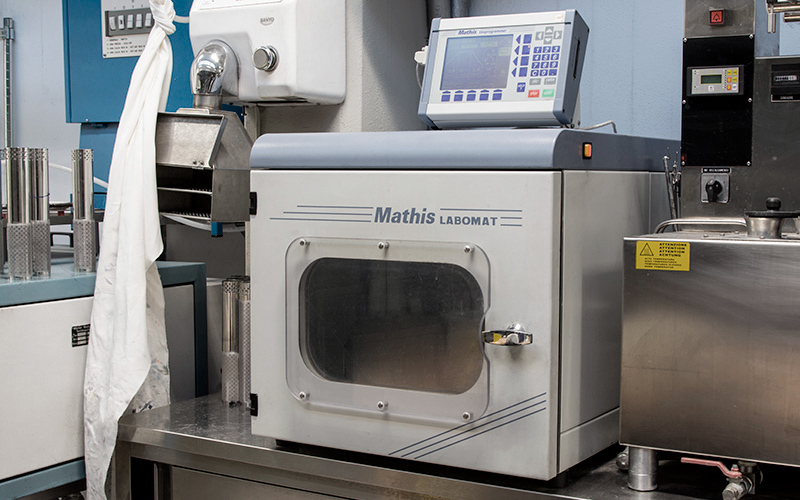 Martindale is used to analyze if fabrics or leathers (natural or synthetic) are prone to wear. 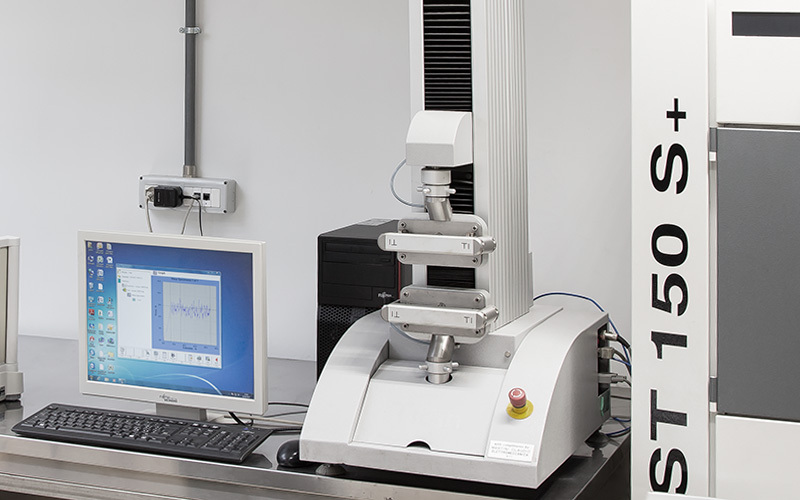 Resistance to threads breakage, pilling formation, color changes and fabric weight loss are the conducted tests. 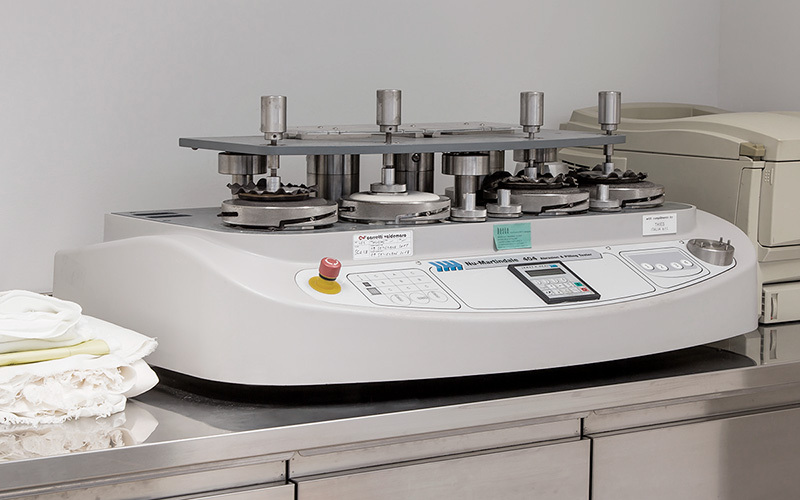 The dynamometer is an instrument used to determine a force applied to orthogonal fabrics. 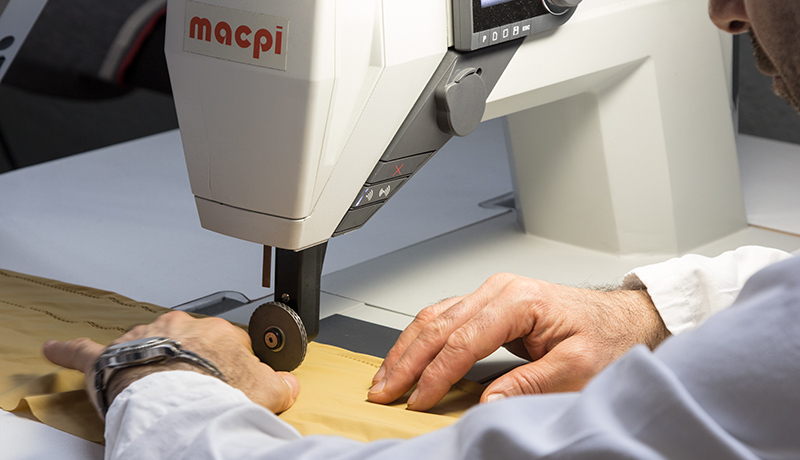 In particular, the carried out tests are: tensile resistance, seam slippage, residual extension and delamination for bonded fabrics. 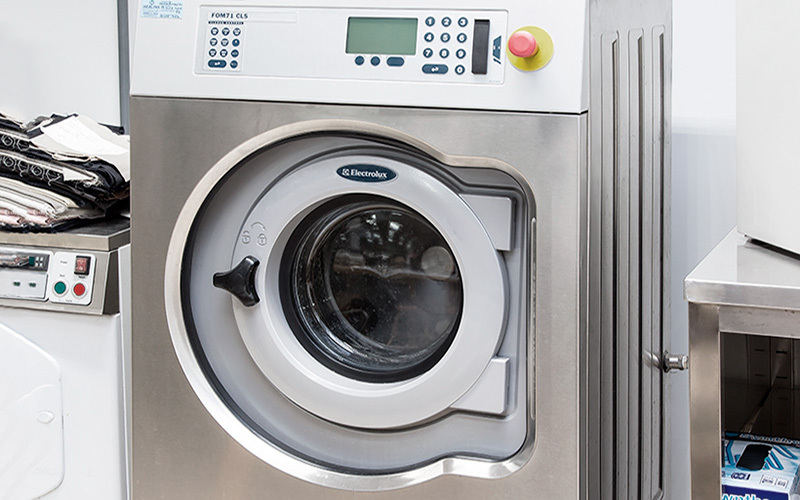 Wascator is a standardised european washing machine for textile laboratories, used to determine shrinkage, dimensional stability and appearance after washing. 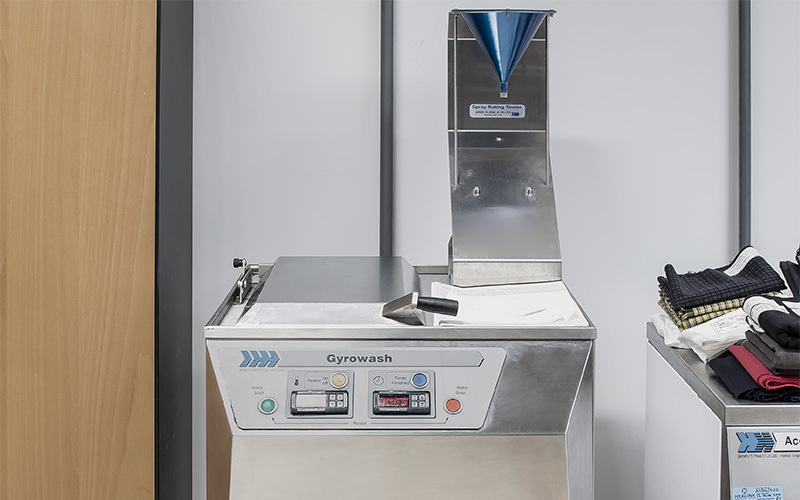 Gyrowash is a washing, dry cleaning and chlorinated water colour fastness tester. 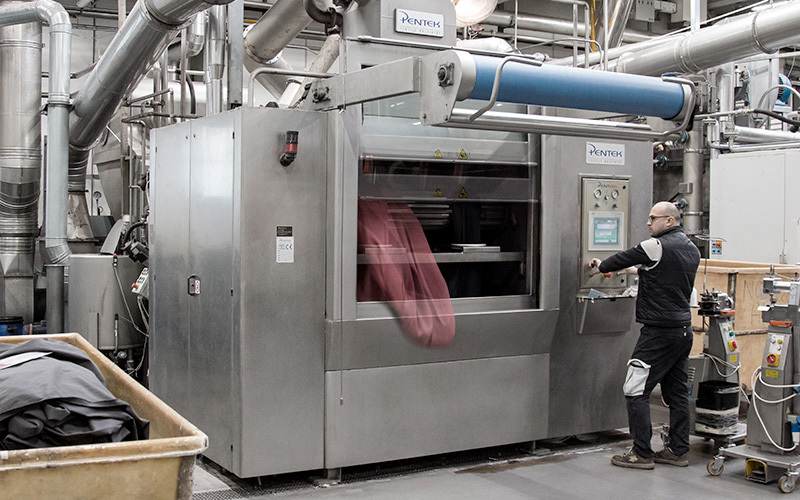 These are some of the most important processes that are carried out before dyeing and are fundamental to achieving a perfect final handfeel and look of a fabric. 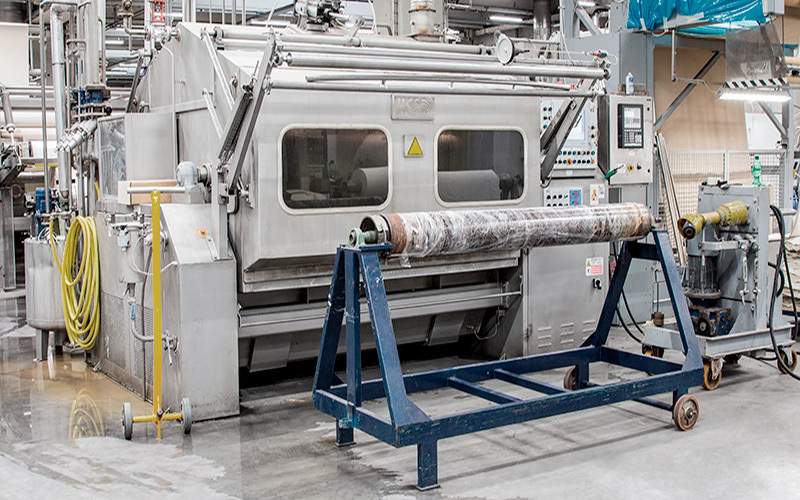 In one single machine, the fabric is washed, bleached (i.e. turned white) and mercerized (a very strong alkaline treatment that prepares the fibers for dyeing). 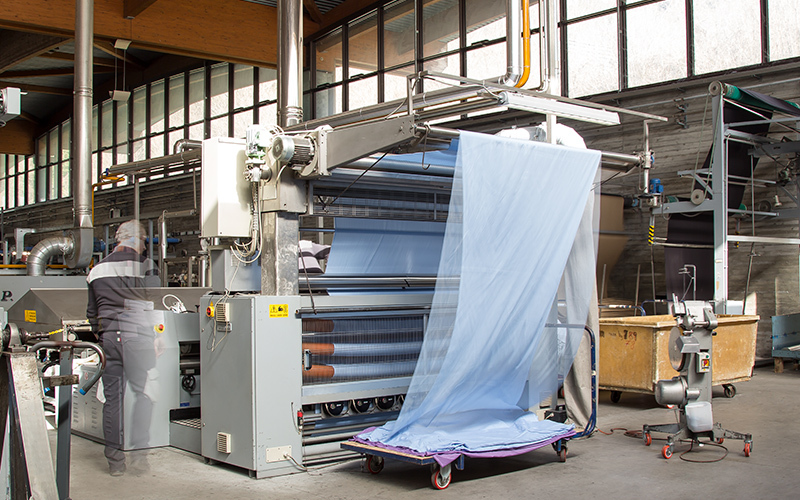 In the singeing machine, fabric is treated with a gas flame that “singes” the loose fibers on the fabric surface so as to make it clean to the touch and to the eye. 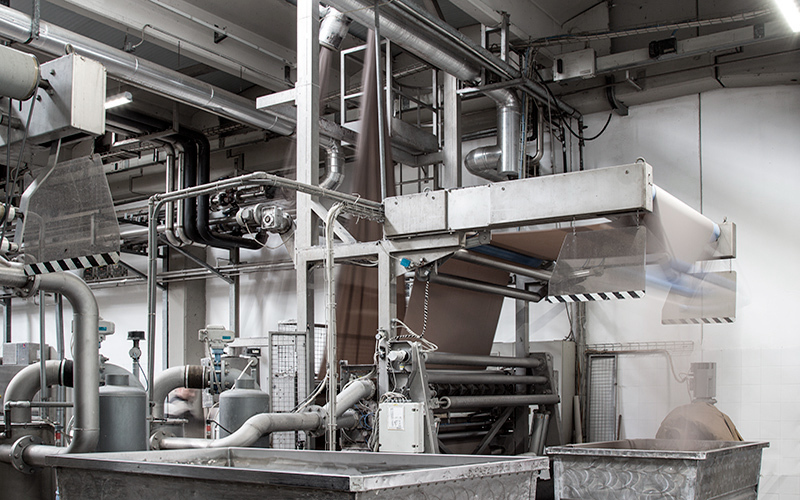 The fabric is impregnated with organic enzymes, that “clean” the external bark of the cotton. 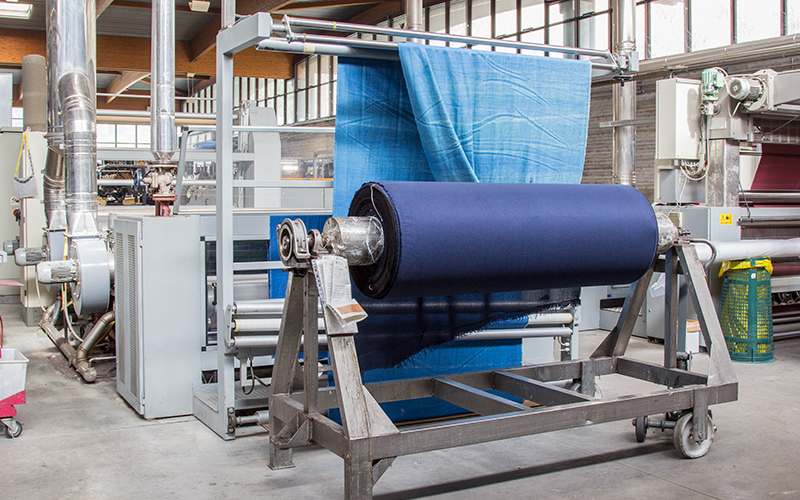 It is a 24-hour spinning process on the fabric. 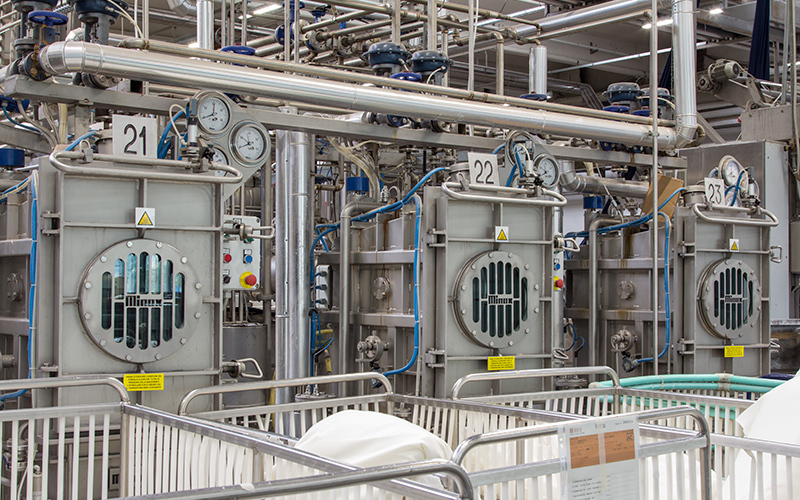 This is the reproduction of the same processes that are carried out in a tumbler but with more industrial and reproducible characteristics. The handfeel and look are not at the same level as the tumbler treatments but they are similar in nature. 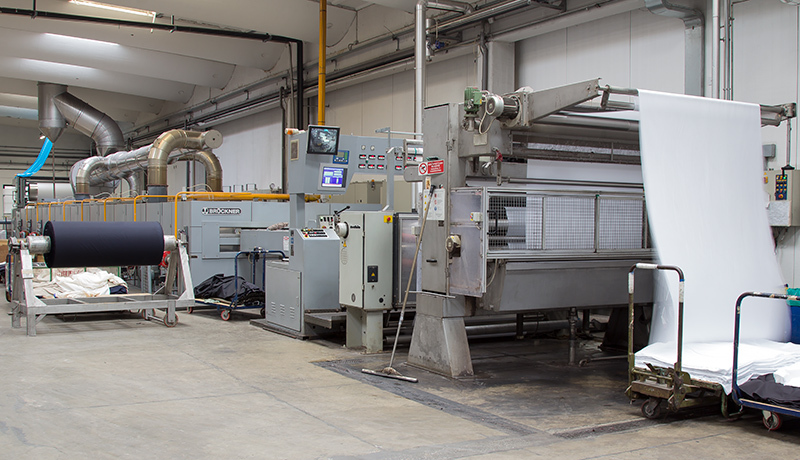 Open-width based machine that prepares the fabric for the following dyeing operations. 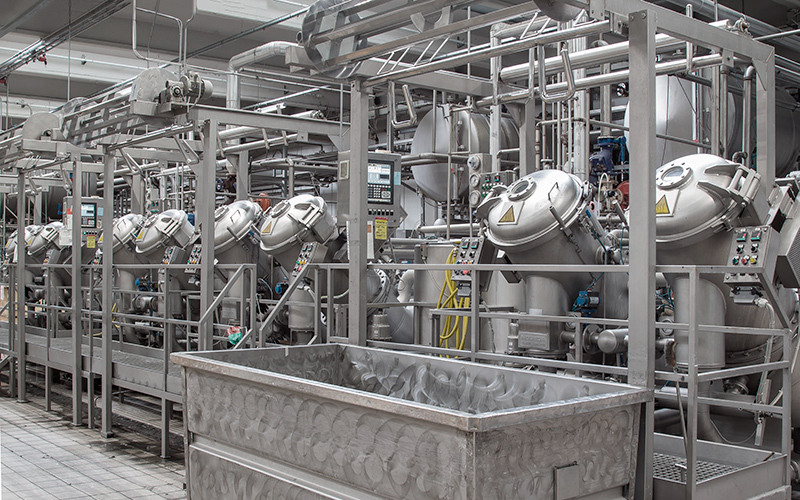 The fabric is washed and treated in enormous “tumblers” to make it special and unique using a technique that is both artisinal and unparalleled. 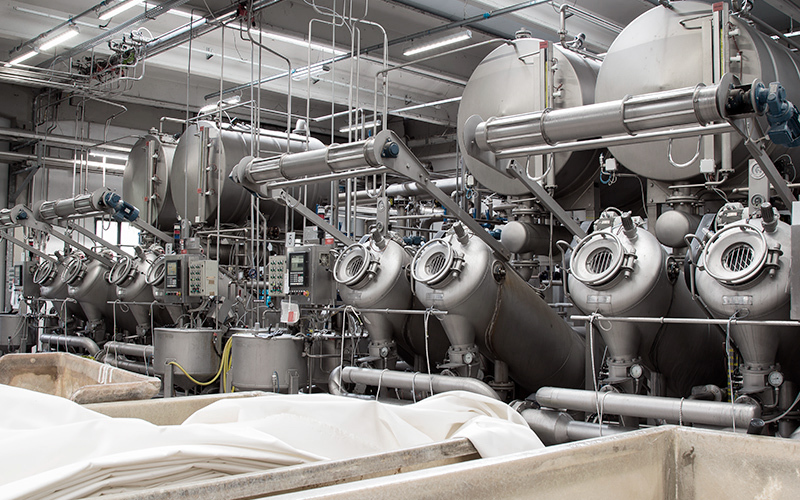 Enzymes, softeners and stones are introduced into the machine along with the fabric to obtain very specific effects. 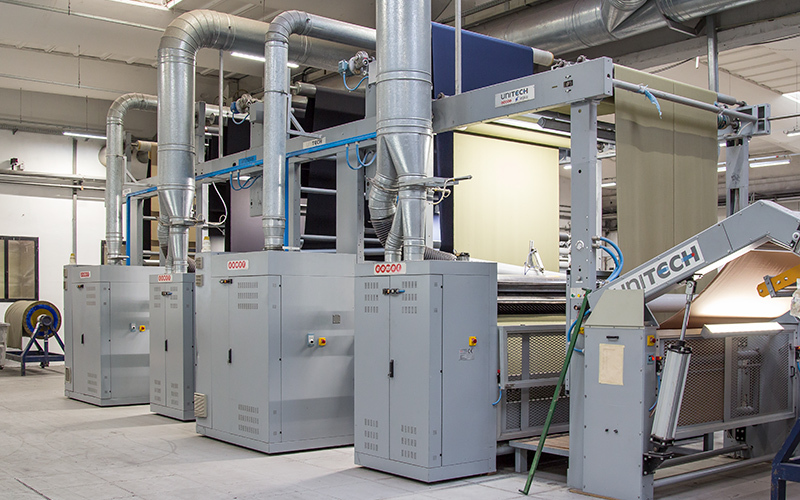 Spinning bins to dry the fabric through steam jet, that results in a unique effect and elasticity of the fabric. 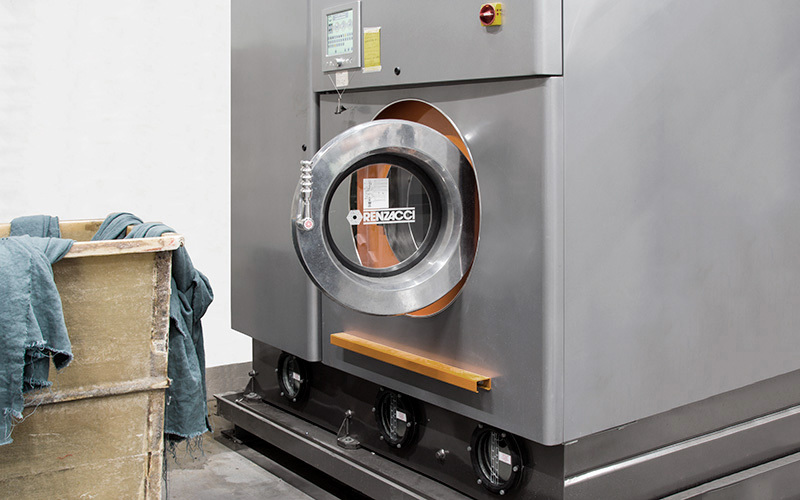 Here at Beste, we respect the environment and for this reason we have equipped ourselves with a dry-cleaning machine that uses HYDROCARBONS which are completely environmentally friendly and do not pollute. 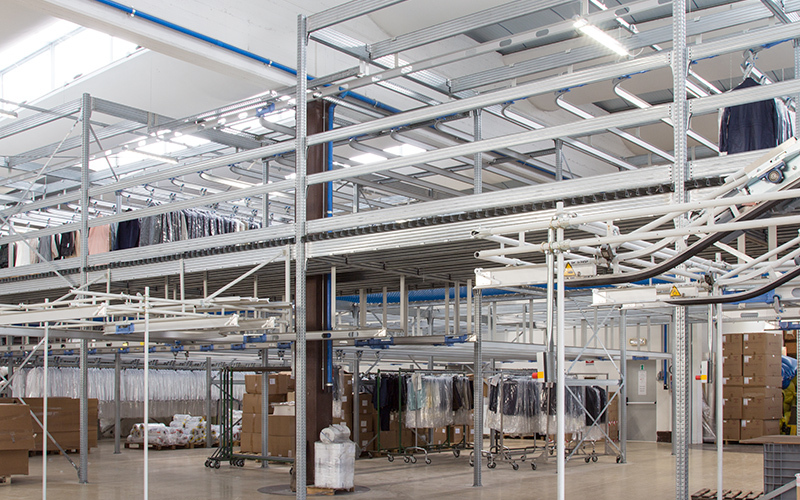 This type of dry-cleaning is recognized as the most environmentally friendly of the existing dry-cleaning methods. 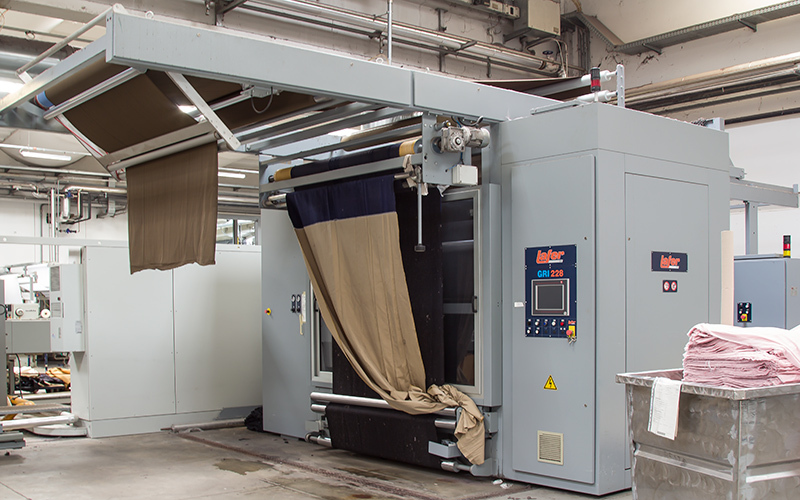 Continuos-dyeing machine that releases different percentage of color, based on specific fabric. This is suitable for, at least, 1500mt batches. Computerized machine for the weighing process, the solution preparation and the dyeing process itself. 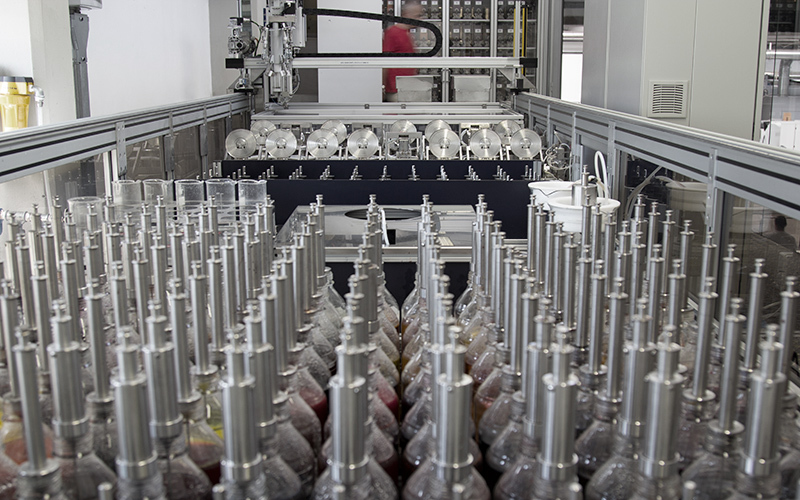 The machine operates automatically 24 hours a day and produces 120 trials per day. 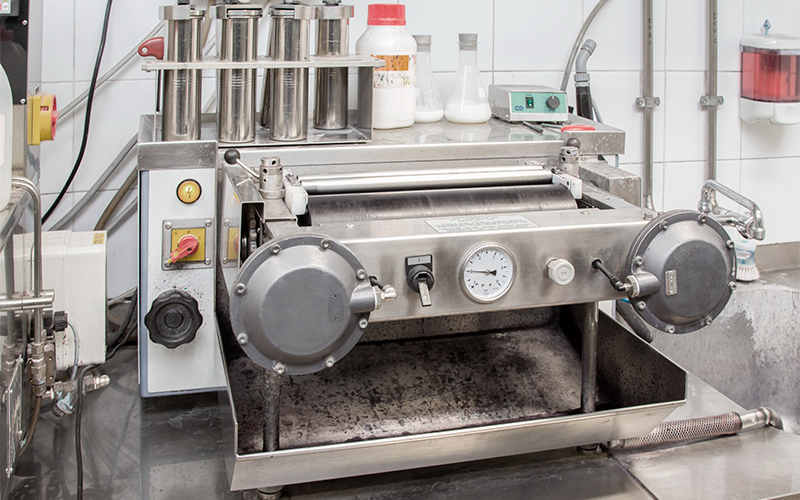 Semi automatic machine to dye small fabric sample into a steel container. It is mostly used for small baths. 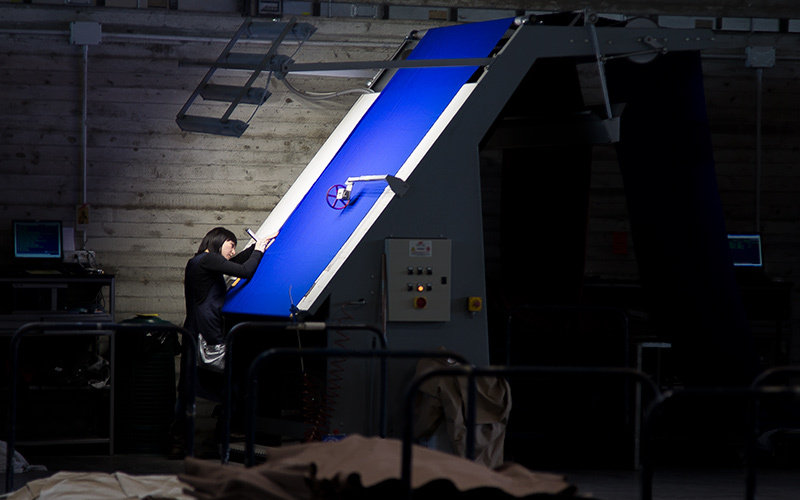 Machine that remakes a miniature of the dye foulard where the production is made. 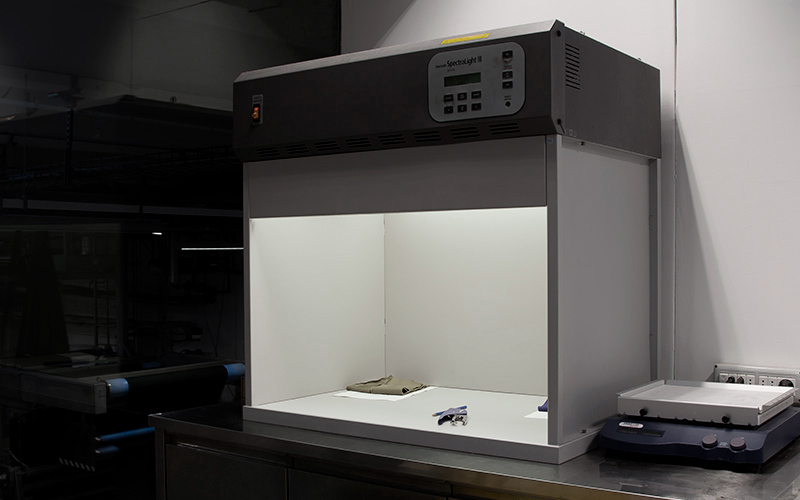 Certified box with six different kinds of lighting to check color shades before shipping. Under a cold, hot, UV lights, the reaction of the color is checked upon customer’s request. In Beste no person touches or manipulates dye powders, chemical auxiliaries or anything else because we have three systems that manage everything with a computerized control; from dosages of 0.1 gram of dye to kg of acids or alkalis. 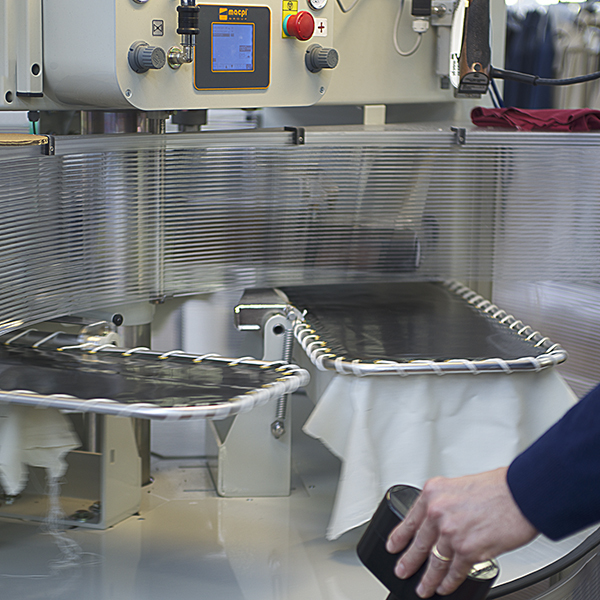 The fabric is expanded to be flat drip dried in the next phase. 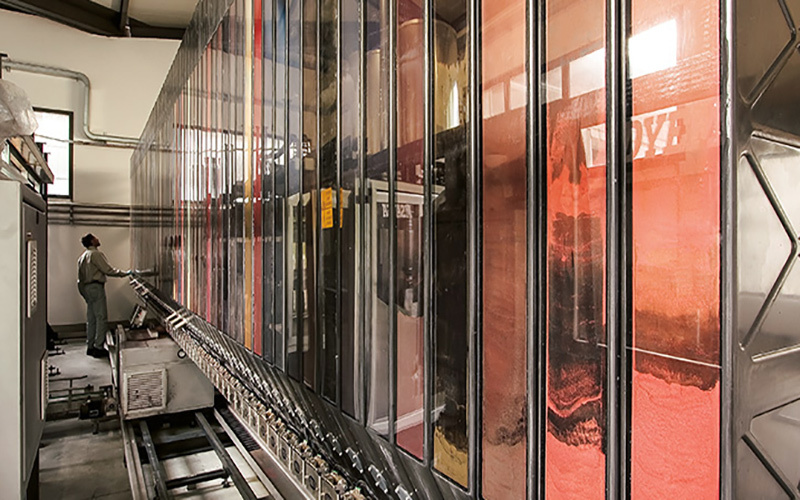 Fabric that is “rope” dyed is dyed with the maximum penetration and depth. This is the most expensive dyeing method however it enriches the quality of the fabric. This is the area where Beste has the most expertise and uses this expertise most often. 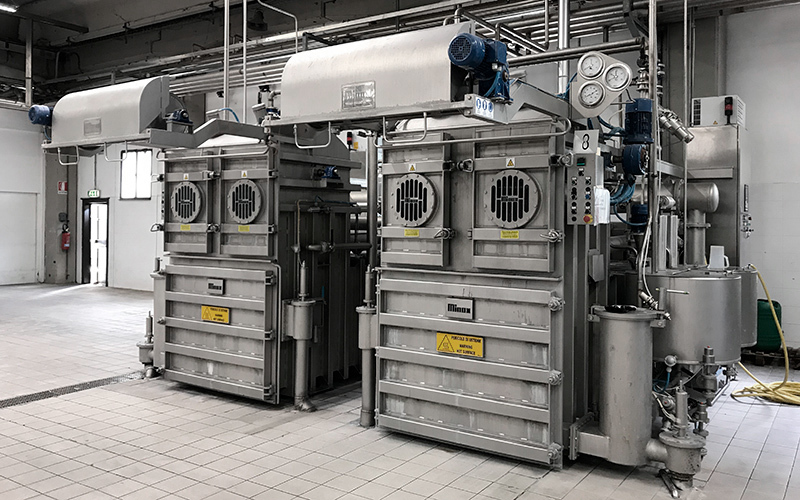 This dyeing is carried out in an autoclave where the modified atmospheric pressure is used to dye fibers (for example polyester) which need these conditions to be dyed. 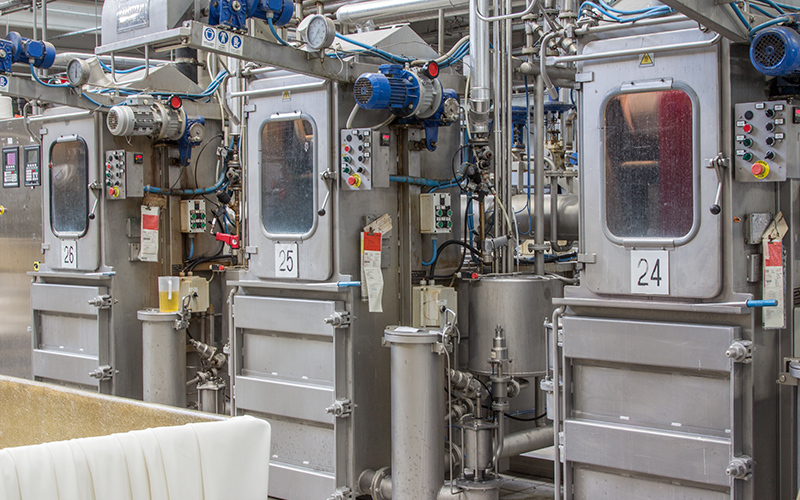 No person touches or handles dyestuffs, chemical auxiliaries or similar products here at Beste because we have 3 computerized systems in place that manage the entire operation: from doses of 0.1 grams of dyestuff to kilograms of acids or alkali. 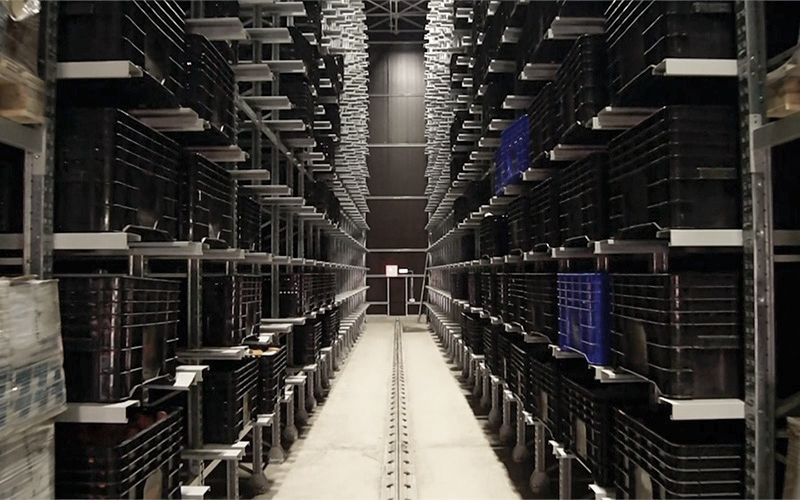 It is a completely dark room with no external interactions, where colors are checked and correct by a technician. 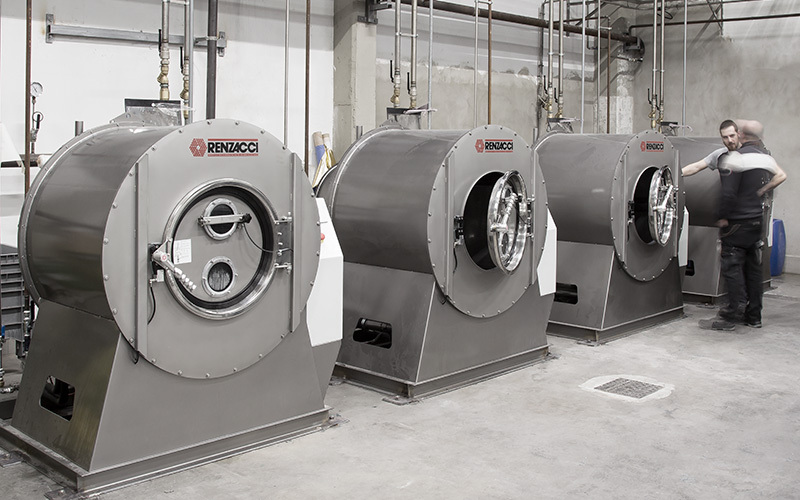 In this machine, the fabric is dried and thermofixed to make is stable against shrinkage (caused by steam water, dry cleaning). 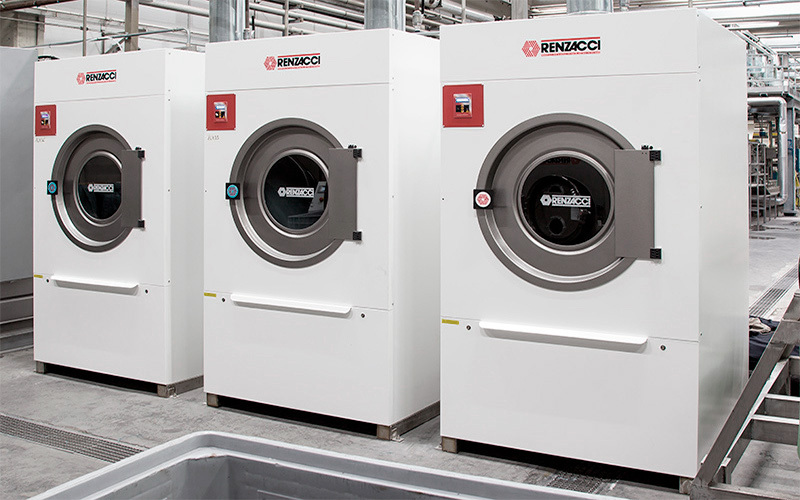 This is another machine that completes the cycle of washing and treating fabrics. This is a milder wash however the fabric is still washed and “beaten” again moving walls that soften it. Fabric is abrased with a very thin diamond – derived sand paper. The goal is to have a peachy handfeel results, with a microfibery effect on a natural fabric. The fabric is ground with sandpaper so as to create a peached look/feel. The final effect is unexpected. 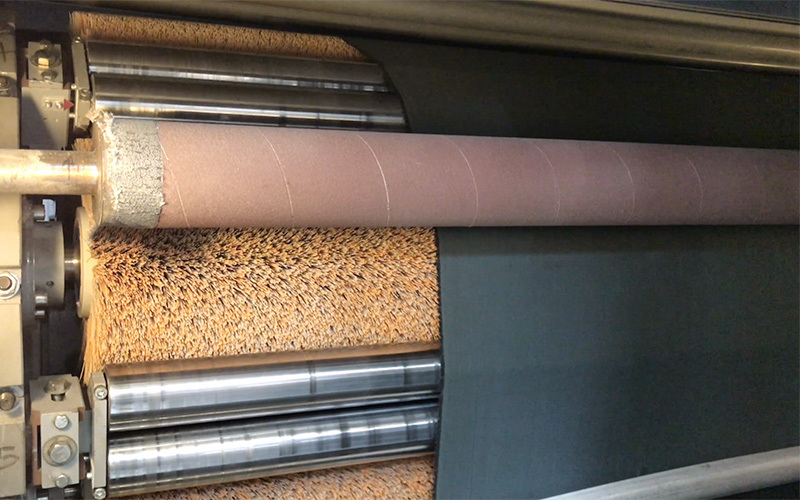 The machine is regulated with high pressure however the greatest risk in grinding is breaking the fabric if the pressure is too high. The fabric is wet brushed, in order to avoid any risk of breaking the fiber. It is abrased to get a “fur” effect. This machine is comparable to a beard trimmer. 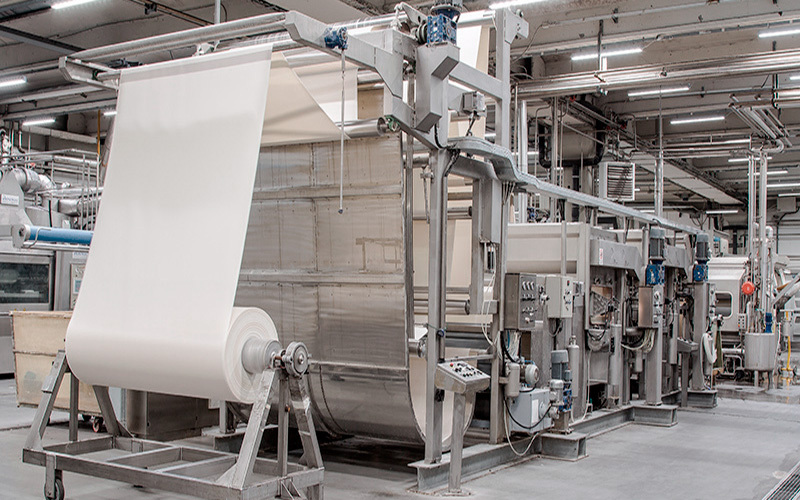 In fact, the fabric passes under a very sharp blade that cuts the loose fibers on the surface of the fabric so as to make the face side of the fabric clean and even. 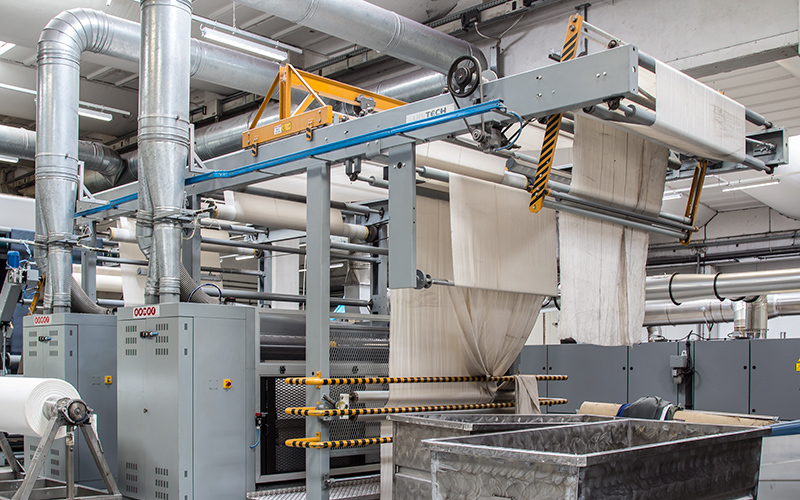 The fabric is treated with the raising machine to bring out the fibers of the fabric and create a fur-like surface. 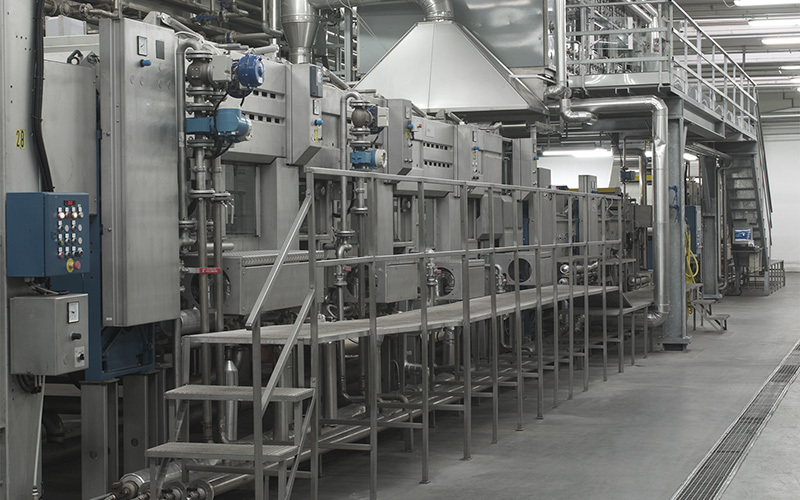 Depending on the fiber, the raising treatment can create very different effects. 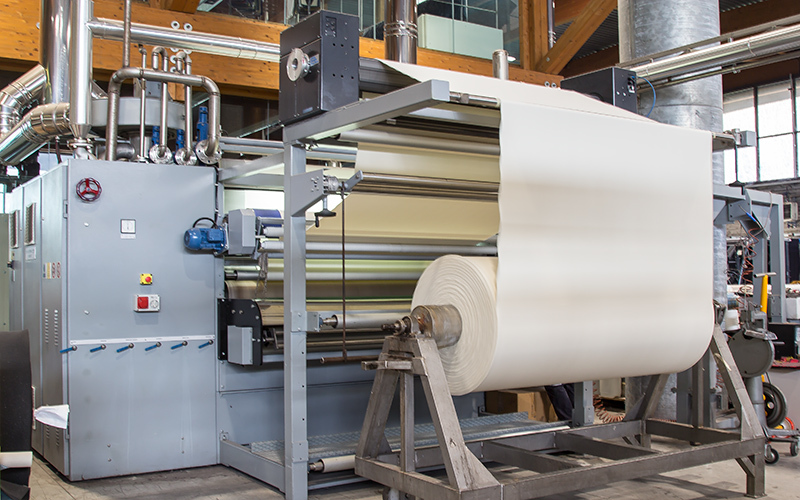 This is an industrial ironing process that is carried out with the use of temperature and pressure that can vary from 0 to 300 tons per square centimeter. In technical terms this machine is called a Sanforizing Machine. 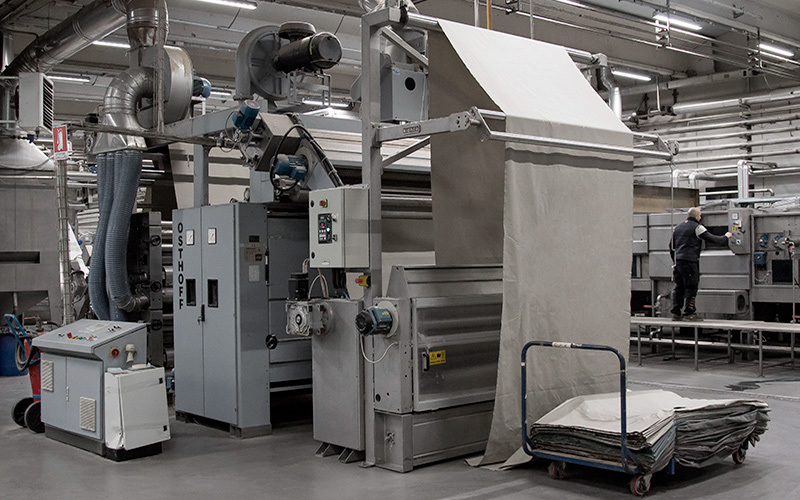 The fabric is moved using a soft cushion and is forced to compact itself when pressed again a steel surface. This is done to prevent the fabric from shrinking or stretching during the ironing or washing of the garment. The fabric goes through a high steam flow that has a tighten effect. 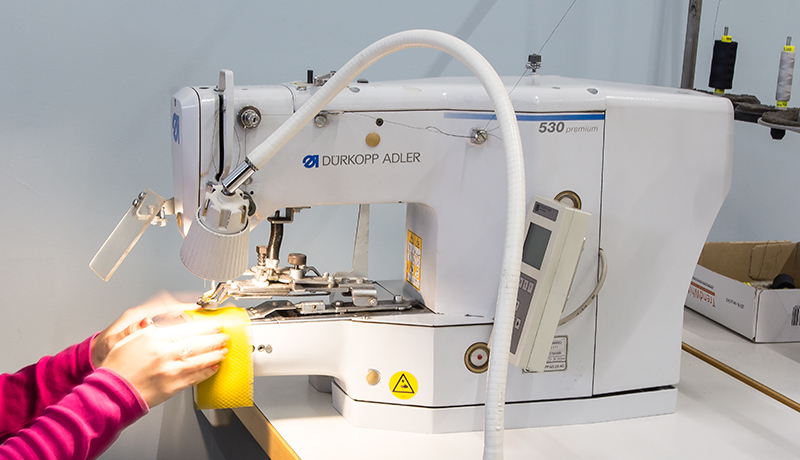 This prevents any defects in the following cutting and sewing operation. 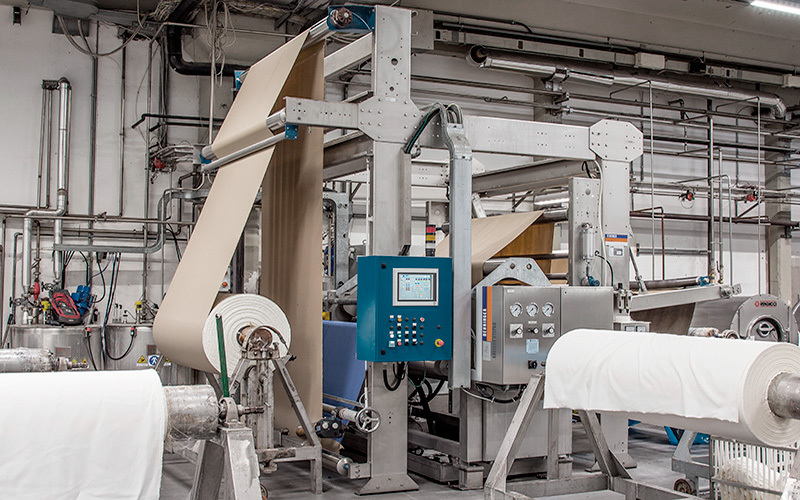 The fabric is rolled using steam and a stabilizing chain with needles that allow the fabric to be moved without tension to create the classic “tube roll” in which the fabric is sold. The fabric is ironed as you normally do with an iron on your head. This is a high precision machine. One fabric is bonded on top of another using only a few grams per meter of glue (around 3 grams per square meter) so as to definitively join the two fabrics together. 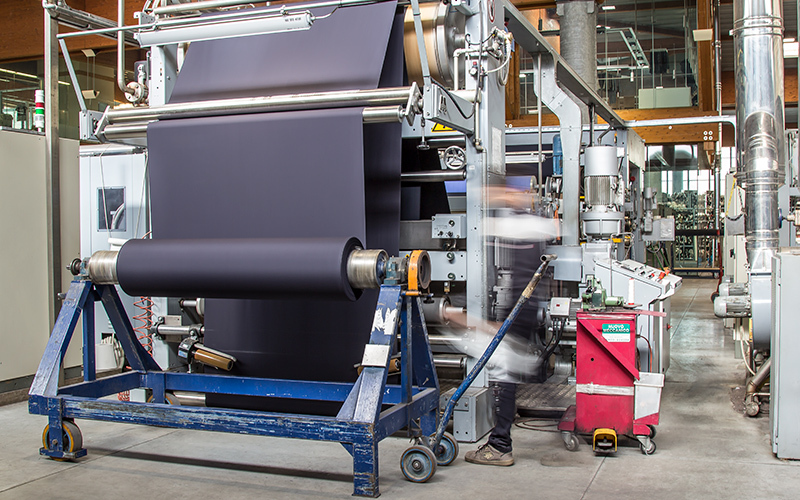 After the dyeing process, the fabric is inspected by highly specialized personnel who check the uniformity and tone of the color as well as the overall look of the fabric before proceeding to the next production process, i.e. finishing. 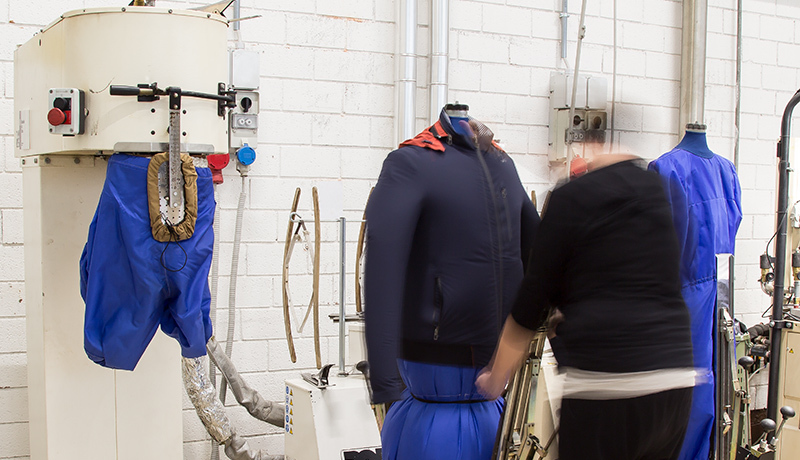 At the end of the production cycle, the fabric is diligently inspected by our highly specialized staff. 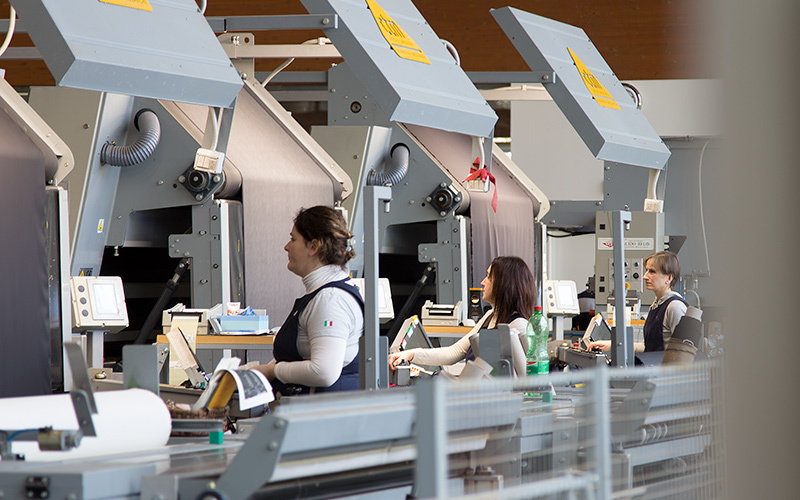 They mark each defect present on the fabric one by one and fill out a report which is sent to the client. On this inspection report, one can see all of the defects of the fabric in map form. 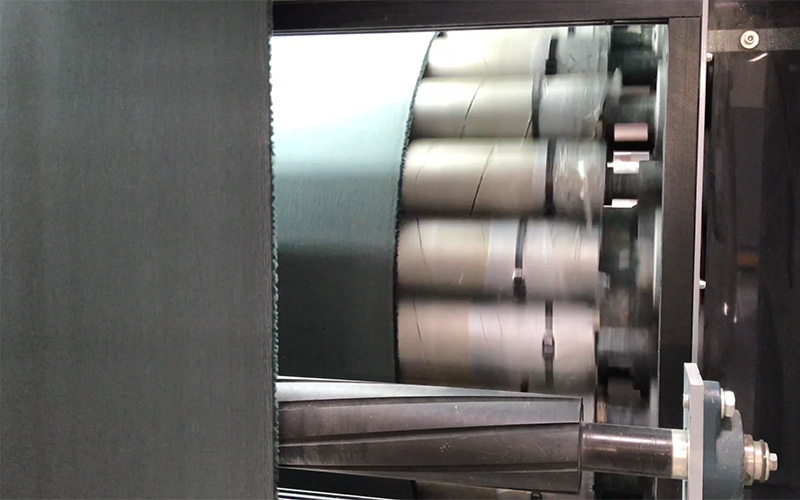 Totally electronic cutting method, done by a circular blade on vacuum carpet guided by the CAD. 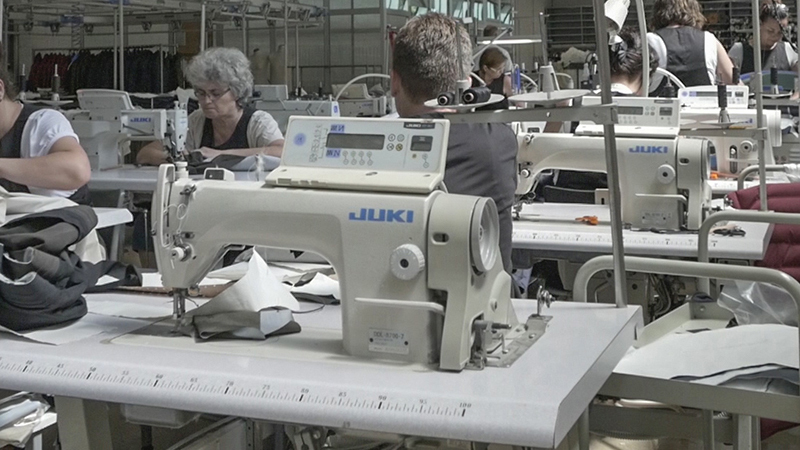 It does a millimeter cutting on different components of the garment. 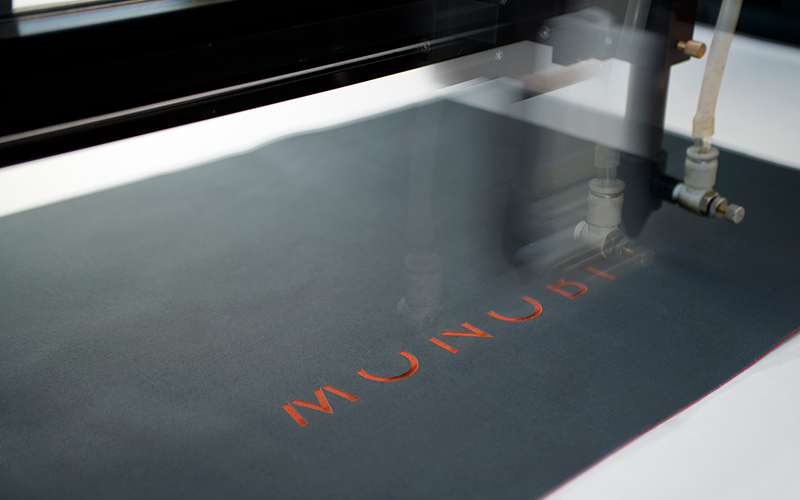 Laser light, it does micrometrical precision cuts , engravings and graphic designs on syntetic materials. Fundamental machine to make thermosealed garments. 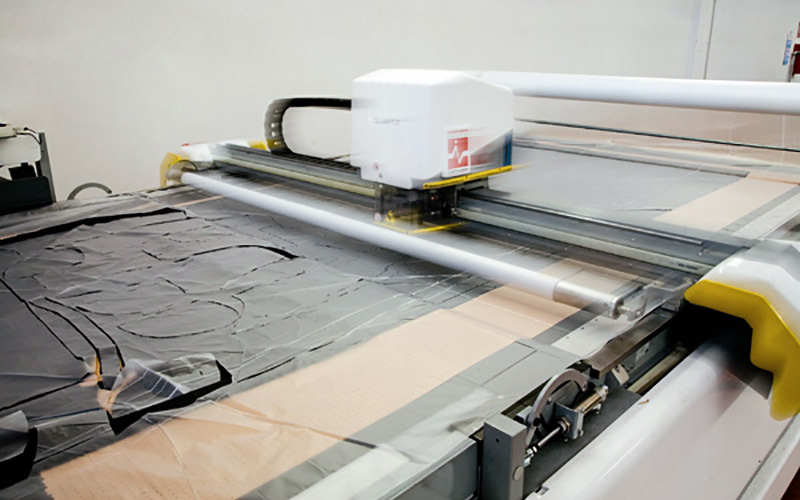 It combines hot press and cold vacuum air to seal the two fabrics together, using the glue thermosensitiveness. A microcomputer controls timing and pressure and save all data. 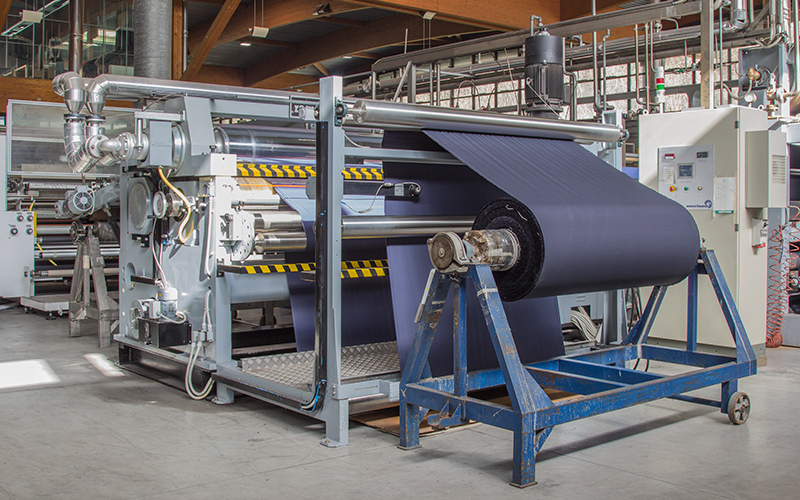 Adaptable machine to all kind of fabric. Through pression and heat, it sticks together different fabrics like a common tape. This is mostly done to prevent any water to get into the seems. 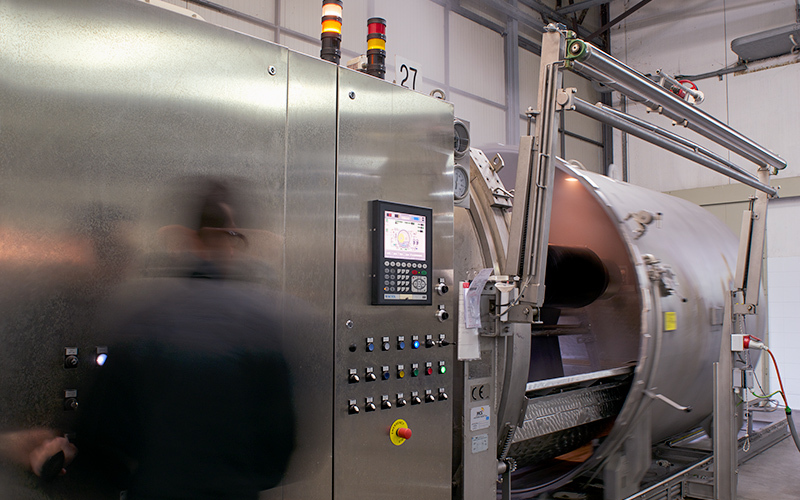 High-technology machine with high-frequency ultrasounds to melt and seal synthetic fiber. It is just like a normal seam but with a different technique. 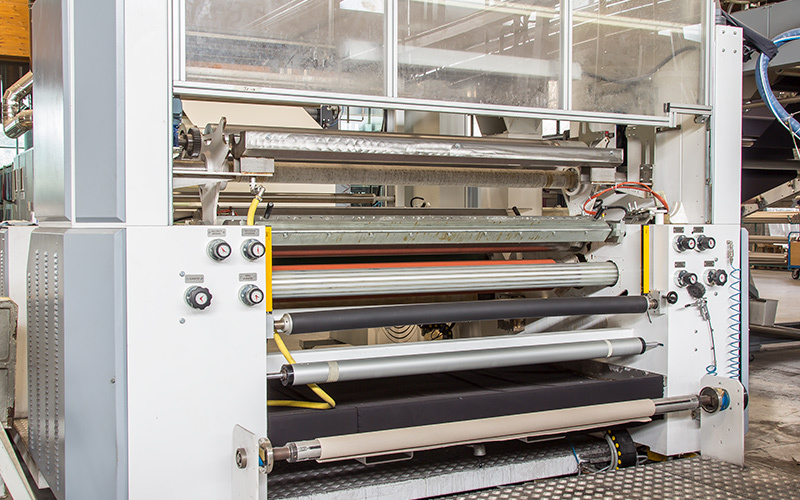 Machine electronically controlled that sews every kind of buttons: with different dimensions, neck wrap lenghts and internal holes numbers. Its name derives from the shape of a upper part of the human figure . 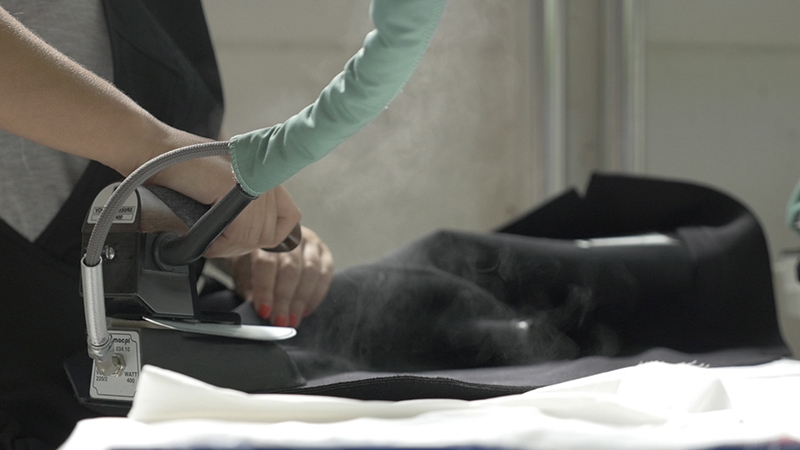 The garment (jacket , coat and generally outewear) is vaporised at hight pressure to iron it and make it less crinkly especially after dyeing and garment washing operations. Classic iron board similar to the domestic one but more industrial because of power and high steam pressure. 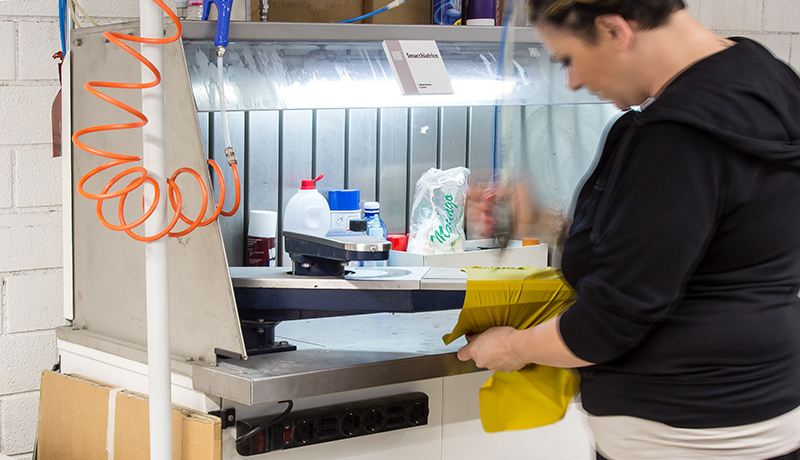 Equipment used to clean faulty garments provided with vacuum and steel work plan. It’s useful to remove oil remainders settled by sewing machines.